A few years ago Météo France snow expert, the late Jacques Villecrose, predicted that despite global warming we would still get a few real winters. With France now in the grip of some of the coldest weather so far, 2005 is set to be exceptional for all parts of the French mountains except the Southern Alps. After a slow start, the first real snowfall didn’t come until the latter part of December, the Vercors mountains has seen a couple of meters of snow over the past fortnight and the Chartreuse and Belledonne are not far behind. In the Pyrénées there is over 3 meters of snow in many areas and the valleys of the Isère and Savoie have been covered in white for much of January and February. The exceptional conditions are too little and too late to save some ski areas. The tiny ski resort of Le Sappey en Chartreuse has been doing exceptionally well during the peak February holiday period but the mayor says that plans to diversify out of skiing are well underway. 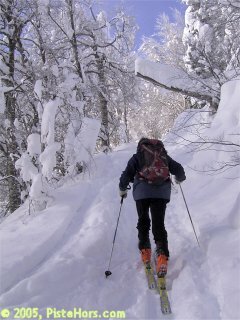 However for ski and snowboard tourers and snowshoers this winter is proving to be one of the best for the last 15 years. Routes which last year would have to be started on foot are now practical on skis from the start. We should have realized it was going to be a hard winter when we saw our neighbour stacking 12 cubic meters of wood! The DDE (Highways Department) of the Savoie reported that by the middle of February they had used the same amount of road salt as in the whole of 2004. Roads in the Massif Central have been all but impassable during much of February and the Mont Dore train was stopped by over a meter of snow on the tracks this morning. Temperatures fell to -15C overnight at Clermont Ferrand, last year they’d been closer to 20C. But the signs are contradictory. Max the migrating Swiss Stork set out for home from his winter nesting grounds in Morocco a whole two weeks earlier this year. So enjoy the winter conditions while they last and lets hope for more real winters.